But a phenomenon called gravitational lensing – the bending of light by massive galaxy clusters in the line of sight — can magnify the distant universe and make dim, far away objects visible. Typically, lensing magnifies galaxies by up to 50 times, but in this case, the star was magnified more than 2,000 times. It was discovered in NASA Hubble Space Telescope images taken in late April of 2016 and as recently as April 2017. 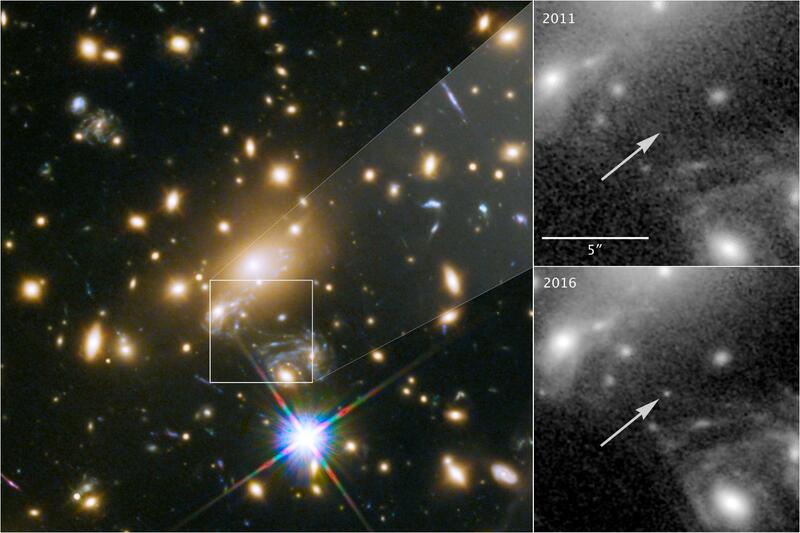 "For the first time ever we're seeing an individual normal star – not a supernova, not a gamma ray burst, but a single stable star – at a distance of nine billion light years," said Alex Filippenko, a professor of astronomy at UC Berkeley and one of many co-authors of the report. "These lenses are amazing cosmic telescopes." The astronomy team also used Icarus to test and reject one theory of dark matter – that it consists of numerous primordial black holes lurking inside galaxy clusters — and to probe the make-up of normal matter and dark matter in the galaxy cluster. The research by Kelly and Filippenko was supported by funds from NASA, the Christopher R. Redlich Fund, TABASGO Foundation and Miller Institute for Basic Research in Science at UC Berkeley.